Raster graphics represent a rectangular grid of pixels viewable via a monitor. Many of my students ask me whether Adobe Photoshop or Adobe Illustrator is the correct program for their graphic design, print media or image editing needs. And it’s always a tough question to answer. To understand what choice makes sense for you or your business, you must first understand the definition of the two major types of digital images used in graphic design: raster and vector graphics. A raster graphic is a graphic made up of a grid of pixels, often referred to as a “bitmap” format. The word raster is really just a fancy word for “grid” in tech terminology. 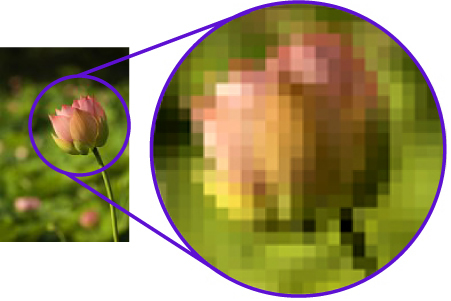 Each pixel, which is short for picture element, is the smallest unit of image information in a digital image. Each pixel can have a wealth of data in it. A larger raster image means you have more pixels in the image to create the high quality of detail. As your raster gets bigger in actual size, the bitmap format starts to create a huge file. So, we often use formats of digital images such as JPG or GIF to compress the data into manageable file sizes. And that compression allows us all to be able post high quality raster images, taken from our camera or phones, and share them via the web, email, social media and much more. Raster graphics often have highly detailed subjects, such as people or nature scenes, because of the ability to use more pixels per inch or ppi. However, the major problem with raster graphics is that although they can be scaled down easily, they cannot be enlarged because you will stretch the pixels and create a blocky look to your image. A good way to think of why this happens is because you are essentially taking the same number of pixels in its original size and just stretching them to fit the scaled, larger size. There are no more pixels added in that process, therefore you get the “pixelated” look we all dread. So, designers use Adobe Photoshop because it is intended for the creation and editing of raster graphics. We choose to use Photoshop to edit existing images taken from digital cameras or if we need exceptionally high detailed images in marketing materials for print or web. Next week, I will finish this topic and cover what are the differences between raster and vector graphics, as well as why it is so beneficial to you. Stay tuned.